On the vacation last year, my family and I went to one of the famous tourist cities in Yogyakarta, Indonesia. That was the second time I visited there, the last time I went there when I was an elementary student. At that time, I went to Yogya on school holiday and when I used economy railroad transportation, I remember well that there were still many peddlers freely to sell in the train, as well as buskers who were free to pass by. Of course, all of them made the atmosphere of the train boisterous. Besides that, passengers were freely stretched on the train floor, and still used the fan. Back to my trip on vacation last year, at that time I went back and used the same transportation that was the train, but this time I used the executive train or the full name of the train was the Argo Wilis train. It took more than 8 hours, it was long enough for a long-distance train. I chose to travel in the morning because in my opinion it would be moretedious to do a nighttime trip because nothing can be seen while the morning until noon I could see the view outside the window we passed. That morning, I boarded the Argo Wilis train from Bandung station. The first time I came into the train, I felt a different sensation from the previous train I rode, it felt like entering a plane cabin. My family and I immediately looked for our seat. I sat in a row on the middle bench in carriage 5, we chose this carriage because it would be far from the noise of the locomotive noise plus the nice sitting in the middle row was free to avoid the noise of the railroad tracks that appeared on the train connection. I sat beside my mother and faced my father and brother. The first impression when I occupied the chair it felt quite soft and can be set as comfortable as possible. There was a small pillow that smells good when I smelled it. Suddenly there was a sound of the engine notifying that the train was leaving. Followed by the announcement regarding the final destination, travel time, and rules on the train. It was the first time I heard it, because all this time I had only used local train so I have never heard an announcement like that. At seven in the morning according to what was printed on the ticket, our train with the destination of Yogyakarta Tugu station departed from Bandung station. I looked around the train. I saw this very clean and neat carriage with the dominant white color for the interior walls and blue for the seats. 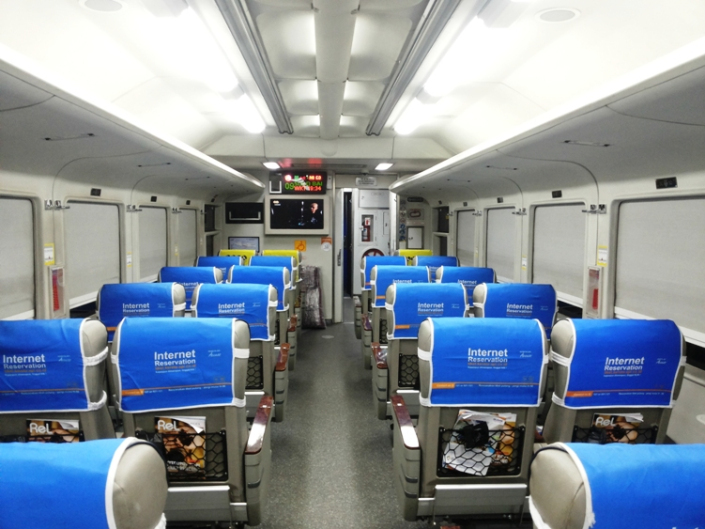 In addition, of course, this train has been equipped with air conditioning (AC). And there was also a TV that only shows train ads from KAI’s private channel, KATV. Therefore I just glanced at it for a moment because there was nothing much to watch. Likewise with other people who were busy with themselves. Cold air began to pierce my skin. That day was too early to use AC. I felt so cold, then I put on my pink jacket. And because that day was still too early and I had no enough time to sleep last night, I tried to sleep again. Fortunately, because this chair is quite comfortable, I fell asleep for a moment. When I woke up I didn’t feel I had slept for about an hour and I felt I refreshed. After that I looked at the view outside the train that was running fast. We passed fields, settlements, and many roads. Then when the train crosses the bridge, the green of the hills and the depths of the ravine also spoiled the eyes. It was very exciting to see all that. 4 hours had passed, my stomach started rumbling for it to be filled. And if we talk about food on this executive train, the train officers themselves who sell their food were really different from the old times. Although the price of food wasn’t cheap and not as much as what was sold by hawkers, of course I prefer this, more comfortable without peddlers. At that time the time showed lunch time I bought 4 packages of hoka-hoka bento for me, my mother, my father, and my brother from the train officer and ate it ravenously. Several times, the train stopped at some stations to transport passengers again, many of them took advantage of the stop time to take a break to the platform, whether to buy food, to refresh their mind, and to smoke because the train was equipped with air conditioning. Smokers were forbidden to smoke on the train during the trip, it must be very annoying for smokers so they took advantage of that time. Likewise with me who took advantage of this time when our train stopped at the Kroya station, Cilacap, for a breath of fresh air for a moment. Then the sound of the train whistled and the sound of the notification engine from inside the train rang again indicating the train would continue the journey. I was quite entertained by the sound of the location notification engine on this train, it made me able to know which station we were at and in my opinion it was also very informative for the passengers because it helped not to go too far or stop at stations that were not their destination. Before I go back to my chair, I went to the toilet first. With a minimalist form, I thought the toilet here was pretty clean with the addition of a mirror and sink. Boredom began to come up to me, about 5 hours had passed. The body aches and the feeling of "why haven’t we arrived yet?" always appeared in my mind. I moved from my chair and decided to go around. I looked around at the other carriage and it turned out that there were some empty benches that people used to stretch. I was tempted to stretch on one of those empty chairs but because I was afraid my mother was looking for me, I turned down my intention and returned to my seat. I also went back to doing whatever activities I could to kill my boredom. My boredom began to peak. Finally to get rid of it, I decided to talk with my family, played games on my cellphone, listened to music, took pictures of landscapes, read up to date news via my cellphone, and also saw location instructions via google maps where I could know where we were and thought how long the distance was my train to the destination. Apparently it was quite long, which was about 4 hours away from our trip. Finally after a long journey of approximately 8 hours, the notification machine on the train announced; "Attention please, in few minutes Argo Wilis will arrive in Tugu. To all passengers who ended their trip in Tugu please prepare your belongings. We remind you to stay in your seat until the train stops. See your services and see you on the next trip." The sentences still lingered in my head. I felt sad and happy to leave this train. The second time I took a long-distance train and the first time I took the executive train, I thought it was quite pleasant. There was no meaningful vibration. It was just that the small sway of the train car seemed to be stirring my head silently even though in the middle of the trip I was able to feel bored but it could be cured by busy doing various things. And all that can be lost if we enjoy the journey. There were many advantages to choose the train as long-distance transportation because the current train service has made very significant progress, which was more economical than other transportation. There were convenient facilities, no traffic jams, no more cigarette smoke billowing on the train, no more merchants on the train or on the platform, no unbuttoned stowaways, no longer an economic train like an oven running; all have air conditioning, and also ordered tickets can be done online so it was easy to get. But also there was something I didn’t like about riding trains, which was a long time to go because it had to stop for a moment at several stations. And then the food was quite expensive and less varied. But beyond all this I really enjoyed the long distance train journey that was unforgettable.